Offer includes eggs, toys, candies, crafts & more. Spend over $39 and get Free Shipping. Some restrictions apply. The offer may not be combined with other deals. Get $15 off $150 or $40 off $300 order. Get $15 off $150 or $40 off $300+ purchase. Some exclusions may apply. Get free standard shipping and $5 off your purchase of $59 or more OR get free standard shipping and $10 off your purchase of $79 or more. Additional charges apply for Express Shipping. Gift cards not included. Offer is valid for e-mail registered customers. Save $15 off orders over $150, or $40 off orders over $300. 2. Select a category for the service you want. You can simply type in your item as a search word. 4. Select an item by clicking on it. On the new page is an image of your item and it’s description. Decide a color, size and quantity if it is needed. Click on “Add to cart”. On the next page is the details of your order. You may add more items to your cart simply by editing your quantity or clicking on “Continue shopping”. Under the heading “Add promo code”, paste your code into the field and click on “Apply”. To finish placing your order click on “Proceed to checkout”. We all love celebrating holidays and partying all day long, and every time when a holiday is about a corner we are asking ourselves where to get all this stuff for celebration. And here comes Oriental Trading - an online party supplies store that helps you make your party truly unforgettable. There is also a great selection of toys and games for any holiday, craft supplies for kids and adults, classroom decorations and many-many more. 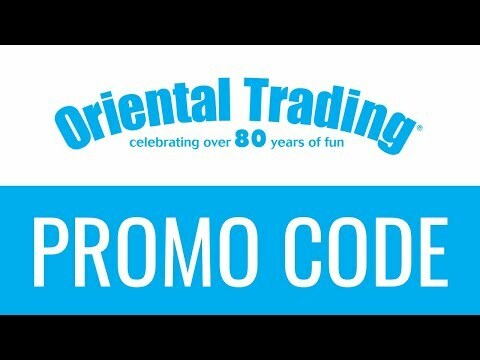 Everyday Oriental Trading provides their customers with huge discounts, free shipping and exclusive offers, so you will definitely get what you need for your party at 100% lowest price. Sign up for Oriental Trading newsletter, follow on Twitter and find on FaceBook and get always the latest and freshest deals.